With it’s large 12.9 inch Retina display and 5.6 million pixels, there will be a large percentage of users who will not only want to use the exquisite touchscreen, but who will also see the iPad Pro as a laptop replacement. Who can blame them–really. Apple has developed a powerful mobile touchscreen device that can meet or exceed the performance and capacity of many desktop systems while still providing long battery life and freedom. Their vision for a keyboard takes advantage of the best of both scenarios. 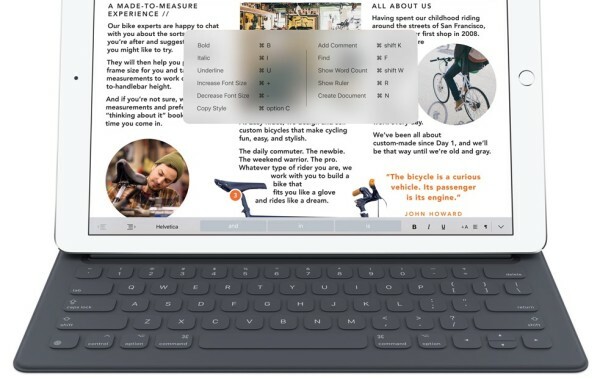 Apple was able to create an connection that allows the Smart Keyboard to interface with the iPad Pro with a new kind of connector. Gone are switches, plugs or The fabric that covers the Smart Keyboard is made from a thin layer of metal within the nylon conductive material that allows for a two‑way exchange of power and data. Because of this unique pairing, there isn’t a need to charge the Smart Keyboard. Apple claims the connection is intuitive, easy to attach and durable enough to handle the routine folding and unfolding of a lifetime of use. All 64 keys on the keyboards are coated in a one-piece water and stain resistant finish that provides both utility and every day function. The cover panels of the Smart Keyboard are made from three different materials. The top layer is made of a durable polyurethane, the middle contains the conductive material, and the bottom is covered in a soft microfiber lining to protect the screen and keep it clean when not in use. Interestingly,the fabric Apple chose to cover the keys with provides spring-like tension for each key. This way there isn’t a need to use typical mechanical keys. With the release of iOS 9, now your iPad Pro and Smart Keyboard can make you even more productive. By adding a number of helpful QuickType features to your iPad Pro you have more control over your personalized experience. You can easily interact with your text with a couple of quick button taps to make it bold, italicize, underline it, and of course, copy and paste. In addition, you can use the shortcut bar to customized your third-party app interactions. Want to do even more? You can also use your Smart Keyboard to search and effortlessly switch between your most used apps. Plus, by pressing and holding Command, Option, or Control, you can view shortcuts in any app, as well as their own built-in custom shortcuts. You can pick up your new Smart Keyboard for $169 sometime in November. I wonder who’ll be comfortable using the Smart Keyboard without a touchpad. You won’t want to reach over the keyboard to touch the screen. Recently I bought a wireless keyboard for my Mac and it was too pointless to use a wireless keyboard without a touchpad. So you may need an extra budget for a touchpad, or something with a function of a mouse. That’s a fair question Chris. However, up until his point, I have never used an accessory keyboard for any of my iPads with a track pad before. So it probably won’t be a big deal to anyone except for those potentially switching from a Surface Pro. Although I like the idea of a trackpad, its definitely not a deal breaker for me. In fact, I sometimes find myself reaching to touch the screen of my MBP, rather than looking for a track pad while using an iPad.